I had surgery on my right knee about a week ago, and until it heals I won't be able to do any hiking. The good news is, I'm officially out of knees to wreck. I've now had both of my knees surgically tuned up, and I hope they'll last for the rest of my life now that my weight is down to something reasonable. So, no hiking for me for a month or so. However, my doctor has given me the go-ahead to do as much walking as I want on flat, even ground. 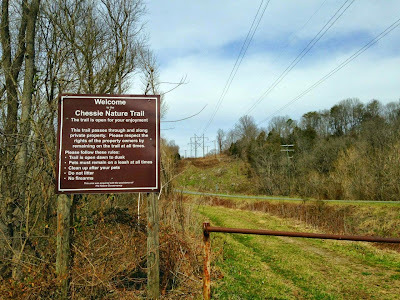 So over the past couple of days I spent some time walking on the Chessie Nature Trail in Lexington and Buena Vista, Virginia. 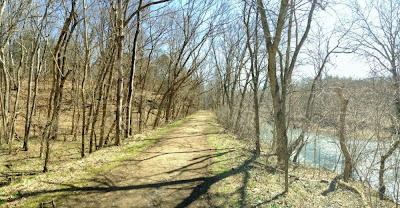 Over the course of a couple of days I finished the seven mile trail. 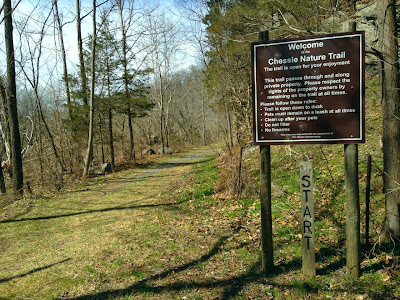 The Chessie Nature Trail is an easy, flat ramble through woods and along the Maury river, and then through pastures and farm land. 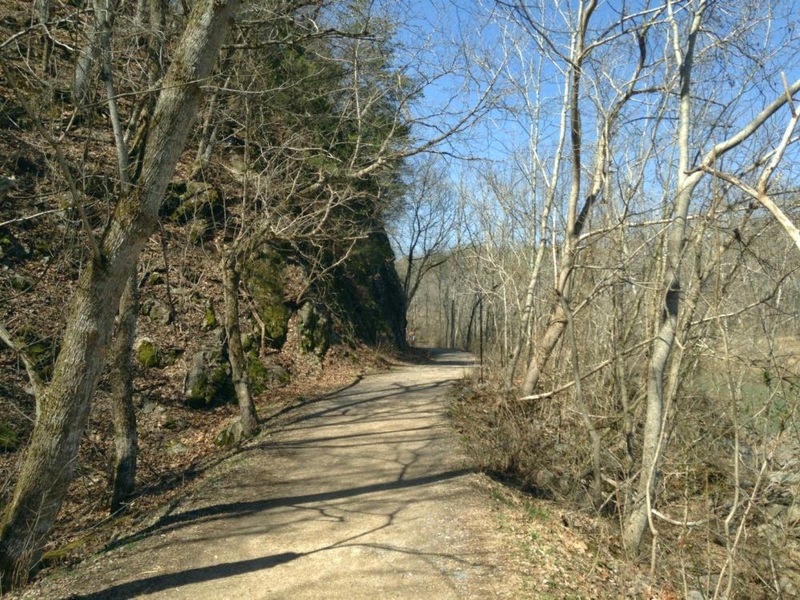 I began the walk on the Lexington end of the trail, and walked to the Buena Vista end, covering a total of about seven miles. Over the course of the trail I walked along the river and through clearings, under the bridges of Interstate 81, and through farms where I shared the trail with more cows than I could count. 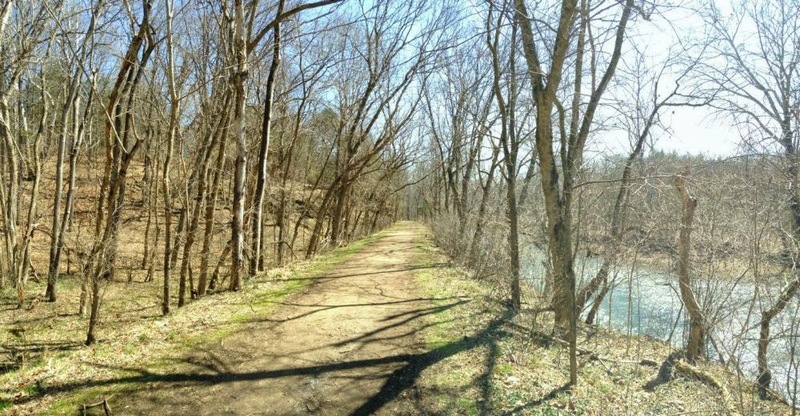 I also shared the trail with more people than I could count. 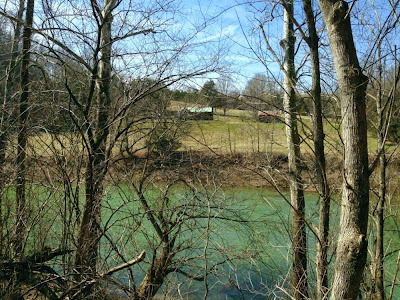 It's early spring in Virginia, and although there isn't much green on the trees or the ground yet, the temperature has been in the pleasant low 60's. 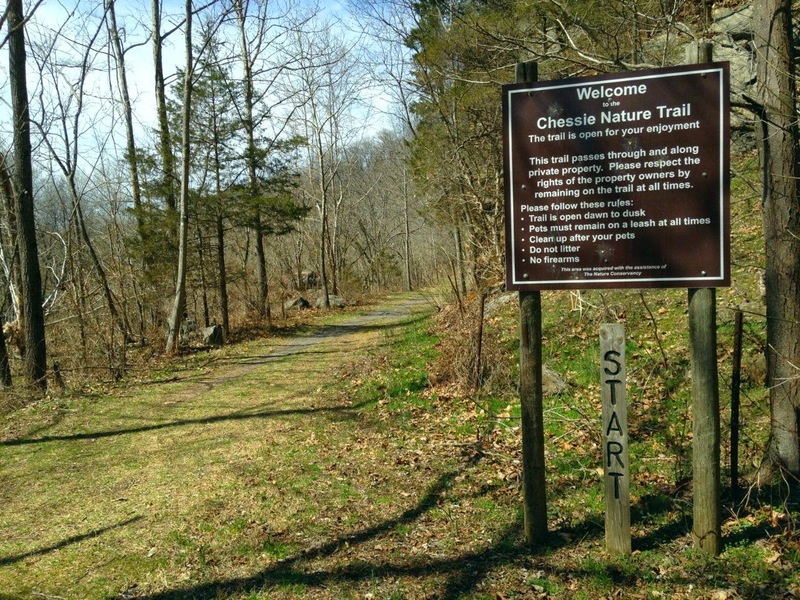 This weekend the Chessie Nature Trail was full of runners and bikers, easy going old folks and intense athletes, laughing children, happy dogs, and at least one old, fat, rambling guy with bad knees. 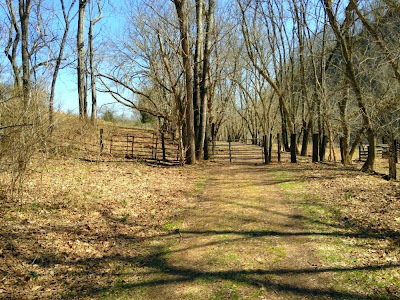 One thing I do want to mention in these notes is that there are several sites on the internet with old information about where the trail begins in Lexington. Some sites say that the trail begins at Jordan's Point Park in Lexington, and if you go to that park, you will indeed see signs indicating that you're at the trail head. Well, that isn't the case. It hasn't been for several years. I wandered around in the park for a few minutes yesterday before stopping and talking to a man who was out walking his dogs. He got me pointed in the right direction. 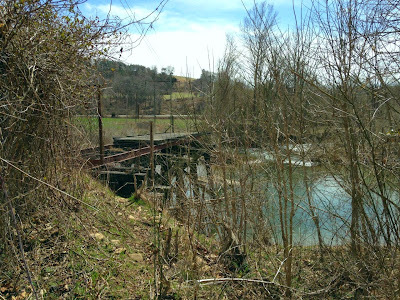 The bridge that once allowed trail walkers to continue onto the trail from the park was washed out years ago. 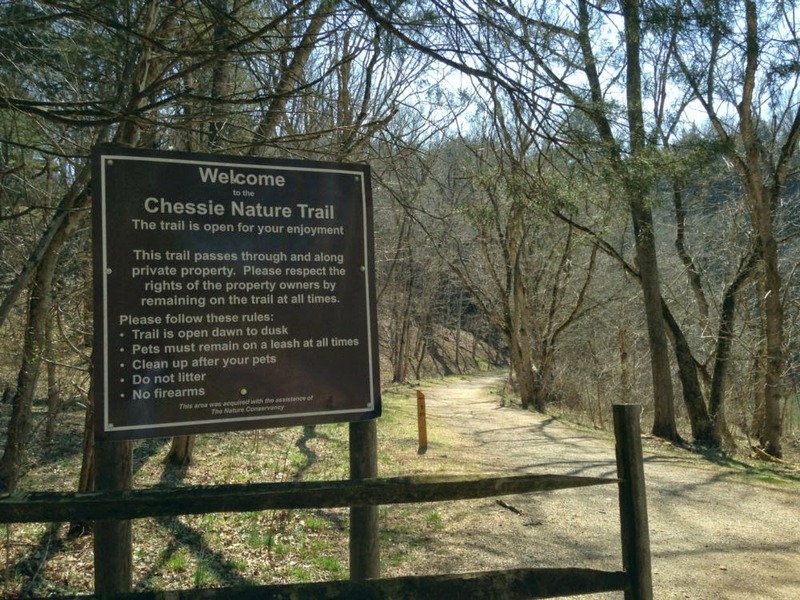 All that's left now is a small, quarter-mile loop of trail and a sign that indicates (incorrectly) that you've found the Chessie Nature Trail trailhead. In order to get to the actual Lexington terminus of the trail, leave Jordan's Point Park and go back out to route 11. From there, turn onto Old Buena Vista Road. 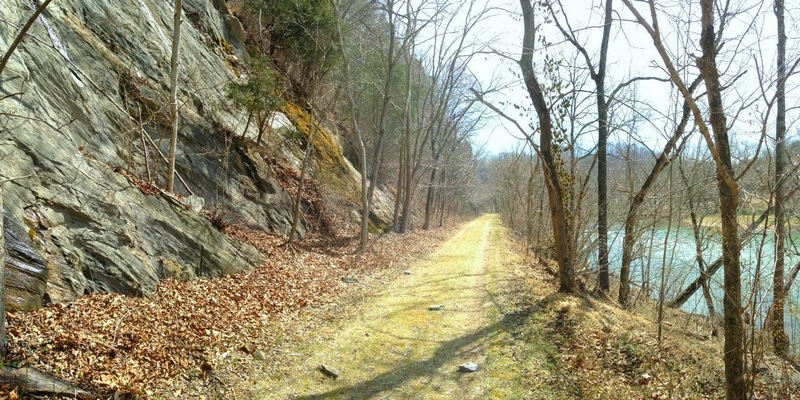 Travel about half a mile and you'll begin seeing parking places along the left-hand side of the road. From any of these parking places you can park and cross the road and take a number of side-trails that lead down only 100 feet or so to the actual Chessie Nature Trail. 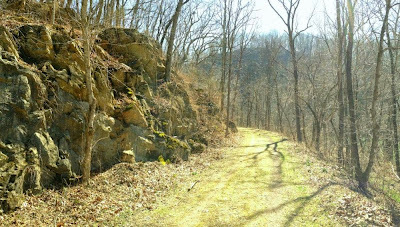 The pictures below begin on the trail from the Lexington end, and finish at the Buena Vista terminus, about seven miles away. 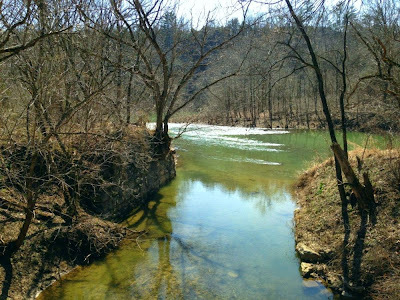 Each picture below is clickable, for a larger version. 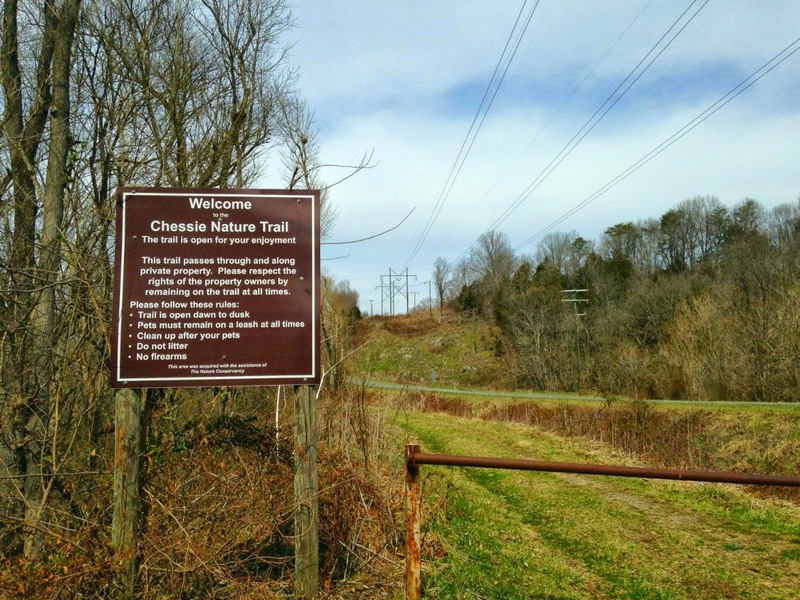 Shortly after picking up the trail along Old Buena Vista Road in Lexington, you'll cross a couple of foot bridges and come to this sign. It was warm this weekend, but it still looks more like winter than spring. 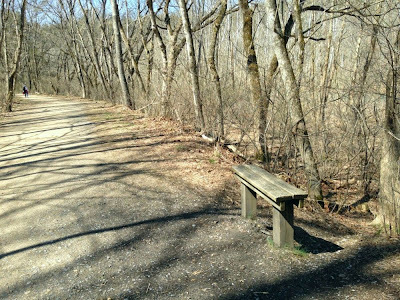 These benches dot the trail every mile or so, which is nice if you have bad knees. 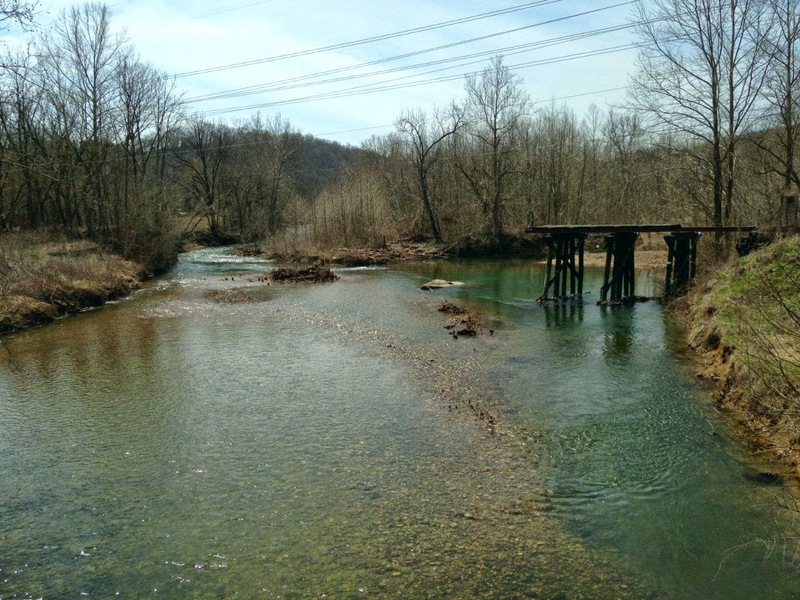 Several foot bridges cross streams that feed the river. You'll spend a lot of time with limestone and forest to your left and clearings and river to your right as you travel the trail from Lexington toward Buena Vista. 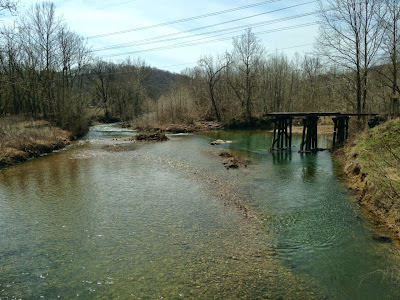 And you'll walk over some bridges, then under two bigger ones, as Interstate 81 crosses above. 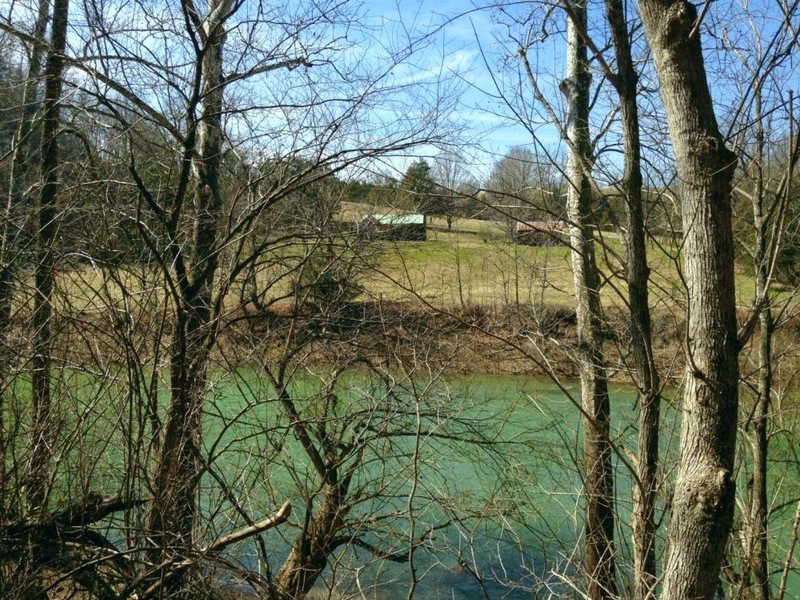 Limestone, trees, farmland, and the Maury River. After you pass under the interstate you'll begin to come to gates. 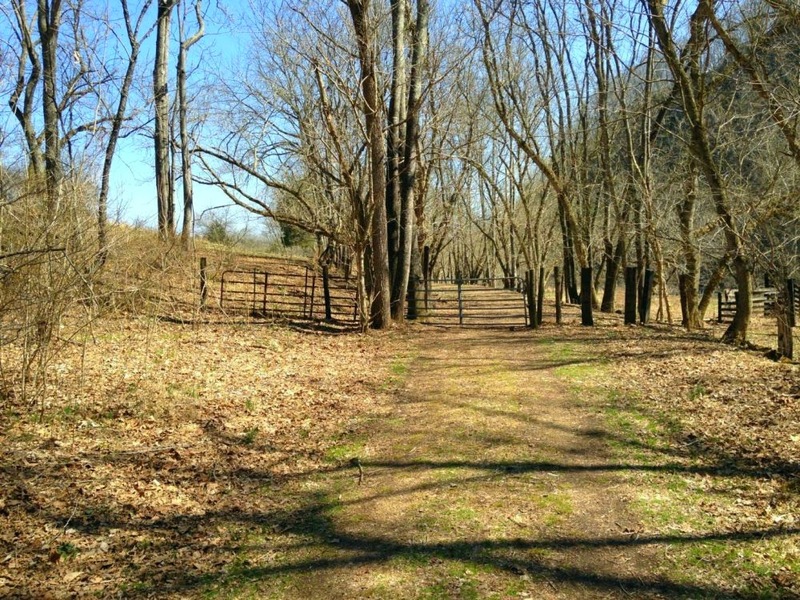 The second half of the trail crosses a lot of private farmland. Each of these gates is outfitted with a ladder, turnstile, or smaller gate of some kind to allow pedestrians to travel through easily. 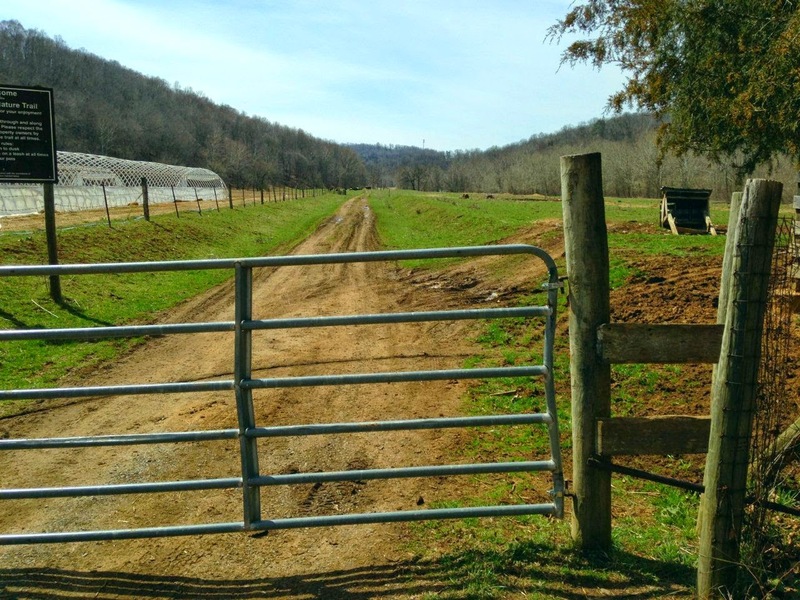 If you're on a bike, you'll need to stop and lift your bike over most of these gates. 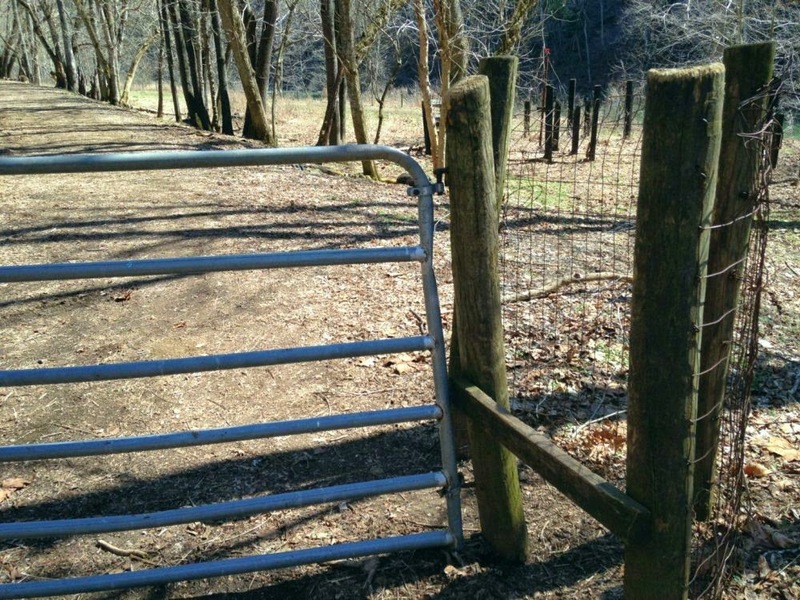 As you can see, neither the cows nor the gates are enough to stop bike riders from enjoying the Chessie Nature Trail. 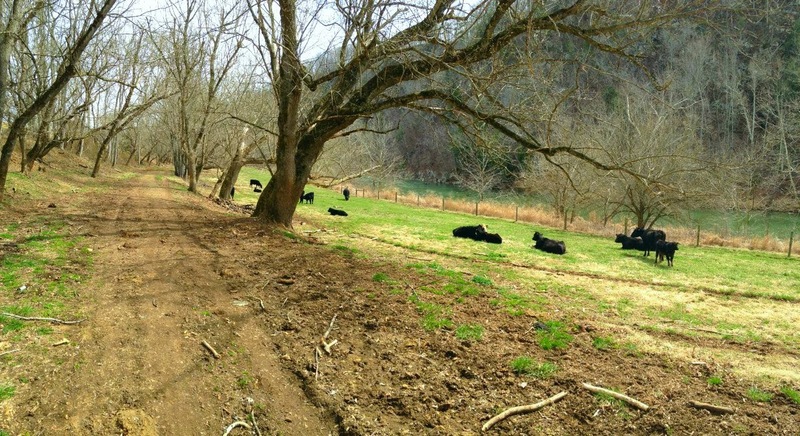 One thing that has surprised me when I've read other people's trail notes is that a lot of people were unhappy about the presence of the cows along the second half of the trail. Having spent time around them when I was a boy, I guess I take cows for granted. I know that a 2,000 pound animal might seem intimidating to people who never encounter anything larger than their dog, but cows really aren't dangerous. Just use some common sense. Don't be afraid to make noise as you get near them. Talk, laugh, let them know you're nearby. Then, walk past them, don't spook them, and continue on your way. 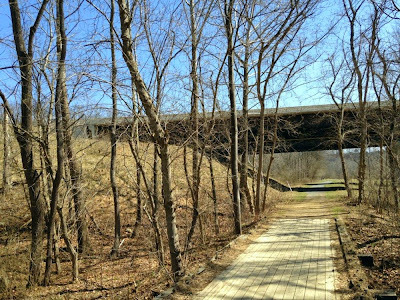 At just past the half-way point, the trail comes to a washed-out bridge. 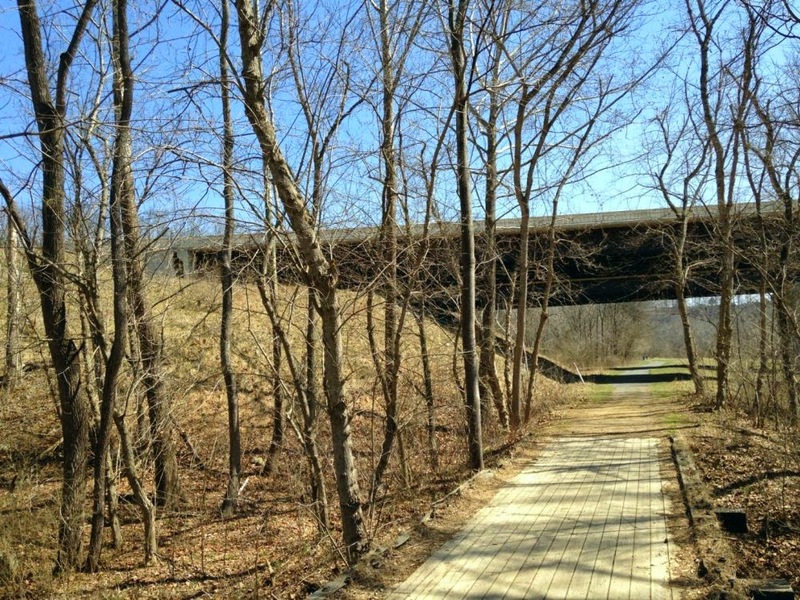 There is a parking area at the ruins of the bridge, and a sign indicating that this is one point of access to the trail. 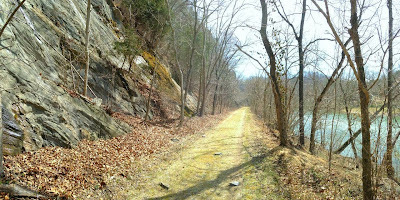 At this point you need to leave the trail and walk along Stuartsburg Road to where the trail picks up again, a little more than a mile down the road. There are several signs that mark all of this very clearly. 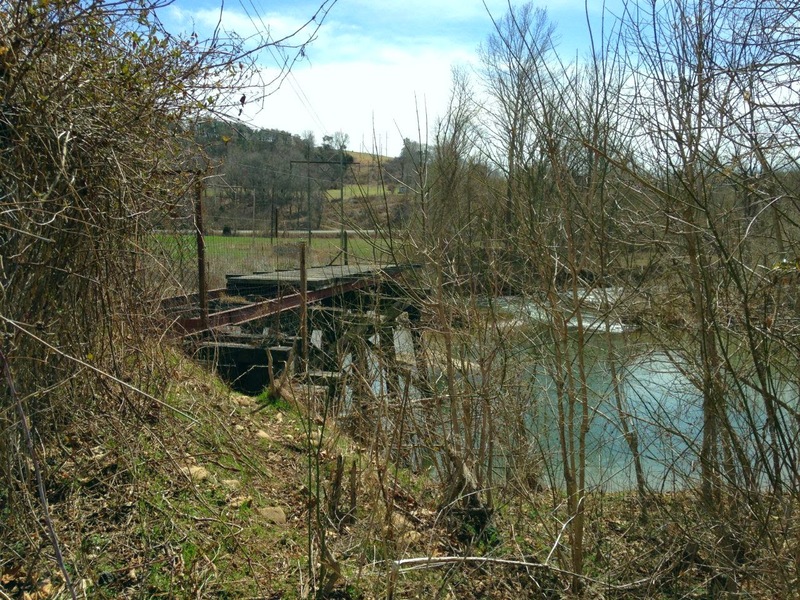 The view of that washed out old railroad bridge, as seen from Stuartsburg Road. 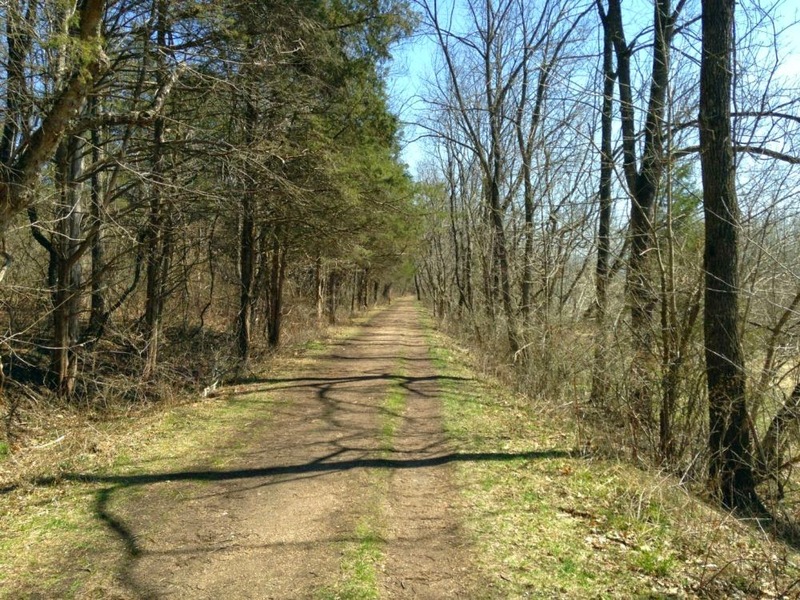 The little bit of time you'll spend walking on Stuartsburg Road is as beautiful and pleasant as any of the rest of the trail. When you rejoin the Chessie Nature Trail, you'll climb the ladder to the left of this gate and cross some more cow pastures. The cows won't be very interested in you as you pass by. They've seen their fill of trail walkers. 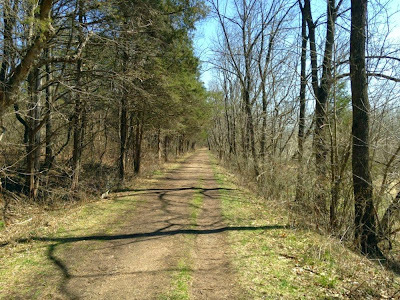 The rest of the trail alternates between woods and pastures. There are several more gates to cross in one way or another. 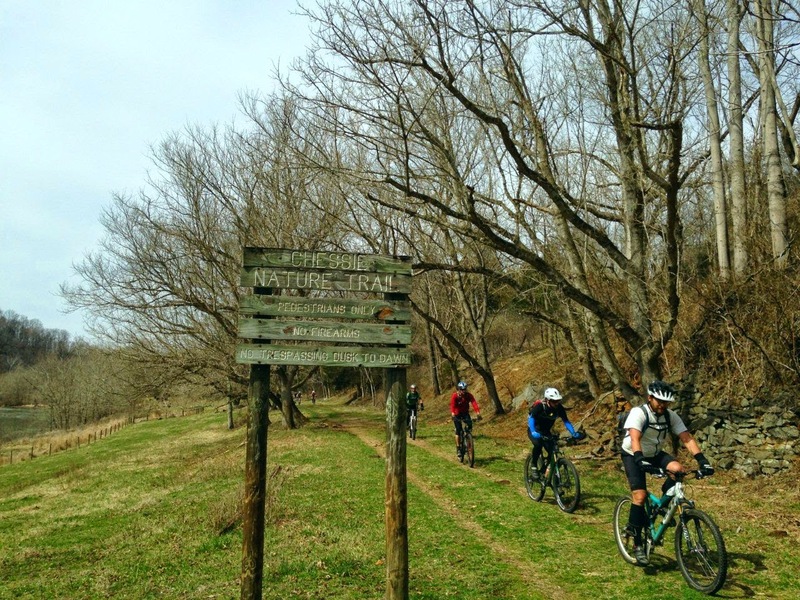 Remember to show the same courtesy to the land owners that they've shown by sharing the use of their land with trail users. 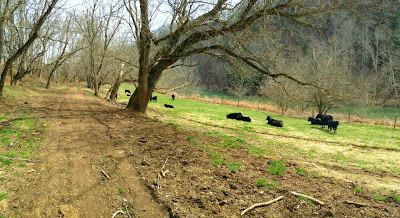 I thought that the pastures and farmland provided some of the most beautiful scenery on the whole trail. The sign at the Buena Vista terminus of the trail indicates that you've reached the start... a good place to turn around and walk back to where you came from.